Vocalist whose long association with New Orleans songwriter/producer/sessionist Paul Gayten resulted in a string of Top Ten hits in the late 1940’s and early 1950’s and who later had a career resurgence lasting into the early 1960’s on her own. Laurie was born Annie Laurie Page in Atlanta, Georgia in 1924 and had recorded without success in 1946 before she was discovered by Gayten who made her a featured performer in his group. 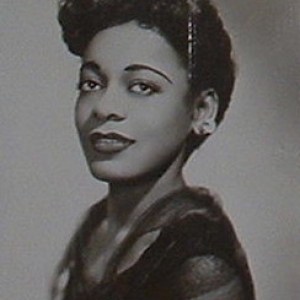 The partnership paid immediate dues when backed by Gayten on piano she had a huge hit in “Since I Fell For You” which managed to cross over into the pop charts, still a rare achievement for a black artist on an independent label such as DeLuxe in 1947. Though this song was more poppish, she was versatile enough where she’d flirted with jazz as well before finding her most appropriate medium with rock ‘n’ roll. Rapidly improving on her initial tentative vocals, Laurie became a fairly confident and commanding singer who could deliver on a variety of approaches from torch ballads to more uptempo material. After DeLuxe Records was taken over by the King label she followed Gayten to Regal Records, which was owned by the founders of DeLuxe, then after more hits there went with him again to OKeh where despite some good releases her commercial fortunes began to decline. When Gayten took an A&R position with Chess in the mid-50’s Laurie was on her own and it had to seem as though her time in the spotlight was over. But upon her return to DeLuxe (now a King subsidiary) in 1957 she got her biggest hit since her pre-rock side a decade earlier that launched her career, reviving her fortunes and confirming her talents irrespective of whom she was accompanied by. She continued recording into the 60’s where she landed a final hit before her career wound down a few years later and she became a Jevohah’s Witness, putting her rock days behind her in the process. Laurie died in 2006 at the age of 82.